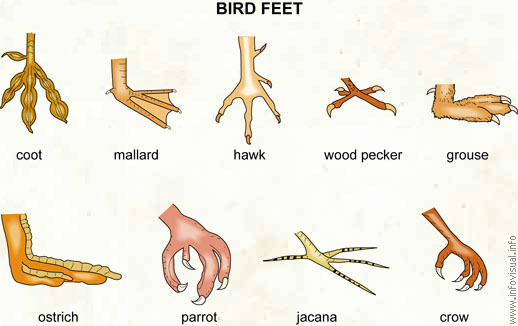 Bird feet - Visual Dictionary - Copyright © 2005-2016 - All rights reserved. [img]https://infovisual.info//storage/app/media/02/img_en/061 Bird feet.jpg[/img] [url=https://infovisual.info/en][/url] - [url=http://www.infovisual.info/]Visual Dictionary[/url] - Copyright © 2005-2016 - All rights reserved. Bird feet: organs used to move and support the body. Coot: wading bird that lives on the edge of swamps. Mallard: duck of the America those male has a green head and neck. Hawk: wild bird, male of the hen. Wood pecker: climbing bird that feeds off larvae found in the bark of trees. Grouse: bird that inhabits cold regions. Ostrich: flightless bird that can run very quickly. Parrot: exotic bird able to imitate human speech and other sounds. Crow: bird that feeds off insects and small rodents.